Today my little ones and I had the pleasure to review a great new book, of which it’s said topic is very important and high on my priorities. 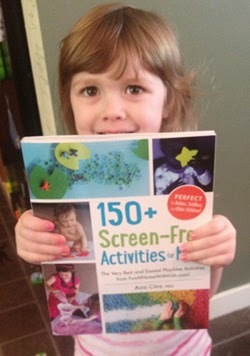 The book is called 150+ Screen Free Activities for Kids by Asia Citro, MEd. It has pages and pages of fun, creative crafts and activities to engage your children, help them get creative, and most importantly, get away from the screens. Don’t get me wrong – we watch TV in our house. We have an iPad. I willingly will put on a cartoon if I’m trying to make dinner. However, since I work with Early-Childhood Educators, and I’m a daughter to a retired teacher, I’m very aware and informed of the importance of PLAY for children and their developing selves. Free play has an integral part on our children’s developing “imagination and creativity – tools, which are now recognized as important down the road in higher levels of math and science – as well as intellectual, social and emotional development.” (Zrinka Peters, Education.com) Even further, research has shown that kids who spend too much time staring at electronic screens “suffer from sensory overload, lack of restorative sleep, and a hyper aroused nervous system” (Victoria L. Dunkley, M.D., Psychology Today). This book was a wonderful surprise to receive in the mail, and the two projects that we tried out were a lot of fun! Most importantly, it makes me feel good that I have a fun, easy to use go-to guide for engaging my littles into free, creative play! 1. You basically combine the salts and water and stir until totally dissolved (about 2-3 minutes). 2. 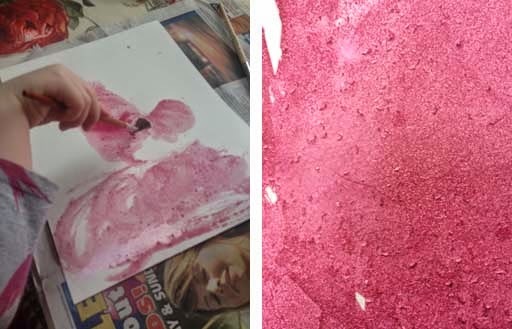 You then add food coloring or liquid watercolors until you get a desired color. 3. Then, paint away onto watercolor paper! It has to be on specific watercolor paper or it won’t work. 4. After allowed it to dry for 2-24 hours, really cool crystal patterns and designs will appear on the paper. I told my daughter Lily that it was crystal tokens left behind by a fairy. This really sparked her creative imagination!